Oscar The Brain Damaged Cat Gets A Second Chance At Life! Three weeks ago Oscar was a healthy kitten who went in for a routine surgery. When his rescuer picked him up from the vet he was paralyzed. She took him immediately to an emergency vet clinic that night and to a neurologist the next day. Oscar could barely lift his head or swallow. The neurologist suggested that they have Oscar euthanized. 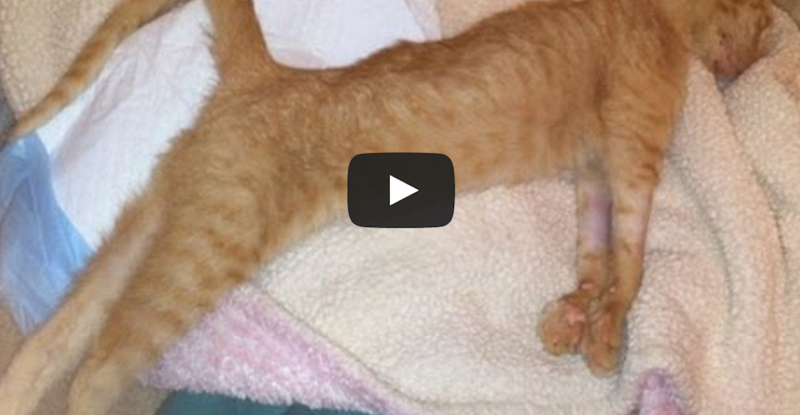 Instead of choosing to end Oscar’s life, she reached out to Kitten Rescue for help. Kitten Rescue assumed responsibility and took Oscar to one of our veterinary specialists. The specialist determined that his brain had been deprived of oxygen for too long causing brain damage. Watch Oscars story in the video below and see his incredible transformation! It’s a lesson on how we should never give up.